Why settle for a mixer study when it is possible to evaluate your entire mixing system? Sample your raw materials, your mixer, your bagging system, and your finished product but submit only the samples of your finished product. If the variation of the finished product is acceptable, then the whole system is acceptable. If not, you have the samples necessary to track down the problem without rerunning the mixer study. Minimum of 10 samples required. Call for a paper that further details this process and to help you to choose the best analytes. * Selenium and Iodine are available, but not eligible for discounted mixer study pricing. 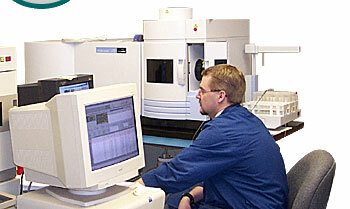 Total analytical variation is a combination of sample prep error and instrument error. Generally speaking, when you inquire about analytical variation, you are given data that represents only instrumental variation or instrumental variation and sample prep variation on a laboratory standard. Unfortunately, sample prep variation is dependent on the actual sample type. Your sample type may make a much larger contribution to the variation found in a Mixing System Evaluation than expected. An Analytical Error Assessment can be useful in finding the underlying causes in the event that your Mixing System Evaluation yields an unacceptably high CV. We can assess the sample prep variation on your particular sample type by prepping and assaying one sample a number of times. The instrumental variation can be determined by assaying a single solution a number of times. This data, in combination with a Mixing System Evaluation, gives a breakdown of your process error and estimates the contribution from each component. This increases the likelihood that corrective actions will be effective, resulting in better utilization of time and efforts.